Bella now loves school. She is starting to love reading for pleasure. She no longer avoids challenges and is excelling at school and home. Her handwriting has improved and is now above grade level. Patrick holds his head straight now and doesn’t block one eye. He makes eye contact much better then he did. His posture has improved, self-confidence and he can catch a ball with ease. He doesn’t complain about going to school anymore. He actually looks forward to it! I went from having a weak, timid reader who dreaded to read out loud to a confident, excited reader who is eager to come home and read. Working with Robert at home was a struggle at first, but once we made it around half way through, his progress was really noticeable. The exercises of home became less of a struggle. I am pleased with the results we have received at South Tulsa Vision Development Center. The staff has been very friendly and professional. They also have been very accommodating with scheduling our appointments. I can only hope that Robert continues to get better and better in the future. Oliver had the highest reading score in his class after starting vision therapy. He went from 85% to 99% – the vision problem was impeding his potential, which was frustrating to him. His soccer skills have really improved too! His coach and other players noticed these changes. Oliver enjoys drawing more, too. He seems much happier because his vision is improved. She now LOVES to read! Vision therapy has turned her into a avid reader. She no longer complains of headaches at the end of the school day. This has definitely led to better, more active, evenings at home. She is also more excited to go to school. The center always made her feel special. The staff always made the therapy and homework be something enjoyable. Overall Drew had a very positive outcome from vision therapy. We saw an overall improvement in his reading and ability to catch small an/and/or type of words that he would often miss before therapy. The home sessions we helpful to continue the weekly practice. Aviyana’s eyes have improved more than I thought possible! When we came in I was skeptical of the process; however, I can see the difference within her school work and her personal life. Her reading skills have improved immensely, as well as her clumsiness. I am so happy with the work by everyone in the office. They work so well with the kids, and are so patient. I would recommend Dr Ford and her office to anyone! 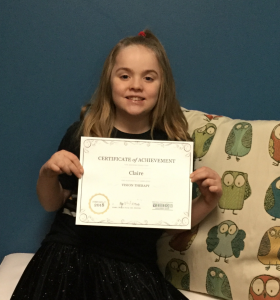 Vision Therapy has been a game changer for our daughter, Claire. She was performing low in reading and beginning to decline in other subjects while entering her third-grade year. It was puzzling because Claire is a very bright, engaged child with good behavior. She enjoyed school, yet her reading always lagged behind other subjects. Claire’s school work went from below average to above average to above average during the span of a few months. She enjoys reading and has read multiple books for enjoyment. My heart is warmed every time she asks if she can read a little longer. This would not have been possible without the therapy. Thank you for all you have done for her. 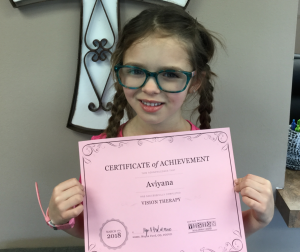 Since starting vision therapy Ashlynn has excelled dramatically in school. Also, as a side effect her confidence level has soared. Now she is able to play more games and do activities she could not do before with her friends and family. I am very grateful to Dr. Ford and her staff for the drastic improvement seen in my daughter. It is not easy to be told that your child is behind so early in his academic career, and it is no easier to hear that he needs to be held back. 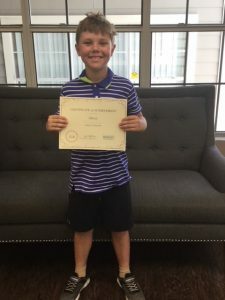 Thankfully, we did not accept that at face value and instead chose to further explore as to why our then kindergartener, Ethan, was struggling in class and to connect with his peers. We then set out on a journey of speaking to many different specialists to hear their assessments of what could be hindering his maturity, with opinions ranging from possible ADHD to sensory issues. Fortunately, my husband took to googling one evening a symptom Ethan demonstrated – the inability to follow his finger with his eyes. This led to research of convergence and tracking eye issues which then led us to the Tulsa Vision Development Center (TVDC). Our experience once we visited TVDC was life changing for us and most certainly for Ethan. Dr. Ford and her thorough and caring team assessed and discovered his eyes were not operating as they should, and walked us through the reasons why and laid out a detailed plan of action on how to resolve it. They educated us and gave us the tools for our son’s success, building a strong foundation for him. Ethan has since improved in his school performance and is proudly maturing each day. We are able to educate teachers and others on what we have learned with materials from TVDC; many are not aware and often times diagnose kids with other things like ADHD, as symptoms can closely align. Victoria’s main concern before vision therapy were troubles with reading and schoolwork. Headaches always developed during her reading and homework assignments. I am very pleased in the results we saw with Victoria’s progress in school during vision therapy. She now reads and does her school work with no complaints! As a parent I am very happy we did vision therapy, because it has made Victoria’s life so much easier. I gave a card to one of my classmates to come see you because they are having trouble reading like I was. I told her that you could help her too! Lilly’s main concern before entering Vision Therapy was headaches. She would visit the school nurse 2 to 3 times a week according to school records. She would complain of headaches when getting picked up from school and never wanted to read in school or at home. Although she was very bright and hardworking, Lilly had difficulty with long reading assignments and tests. She had trouble focusing her attention in school. This is something the teacher communicated with me and we worked on at home, with minor improvements. Our experience with Vision Therapy has been very positive. Once she started getting some relief from the headaches, she began to realize what a benefit Vision Therapy was for her. Her school teacher noticed the improvement in her performance due to her participation in Vision Therapy. Her reading grade-level has raised and her fluency in reading has sky rocketed. Lilly has not been to the school nurse this entire school year for headaches. Her teacher called and told us Lilly’s attention has improved drastically and is such a joy to be around. It is well worth the effort and time! If you can do anything to help a child learn to love to read and feel better about their self, it is worth it! School and reading had never been one of Kyle’s favorite things. Even during his first year of college, he had a difficult time determining a major due to the frustrations of reading and learning. He eventually found his calling to be an accountant, but once he started his internship and long studying and reading hours at the start of his master program, there wasn’t a day that would go by when he would suffer from a daily vision related headache. Kyle knew that working in front of a computer for the rest of his life would be miserable if he didn’t get this solved as soon as possible. That is when he scheduled a vision therapy evaluation, where he was given the diagnosis of an eye convergence and focusing dysfunction. After going through a 3 month vision therapy program, during his second semester of his master’s program he can’t remember the last time he had a headache and also reports that school work is not as time consuming and is much easier to complete. Before vision therapy, Valeria was not doing well in school. She had to repeat 3rd grade because she failed state testing. She was ashamed to wear glasses because they did not help. She would get headaches 3-4 times a week and took naps daily. She would cry because she didn’t know why she couldn’t do certain things in the classroom like the other kids. Her parents thought she was depressed. Their main concern was how Valeria felt. It was hard seeing her come home sad from school and trying hard with no improvement; they didn’t know what to do. Their optometrist referred Valeria to our office for a developmental vision evaluation. Fortunately Dr. Ford found that Valeria actually had an eye coordination problem contributing to her problems. She started a program of vision therapy and worked hard at it. Half way through vision therapy she started seeing improvements and everything started getting easier. She is a happy kid now! I am so glad school is easy for her now, but the biggest thing is she is happy now, that’s all I ever have wanted for her and vision therapy has given us that and so much more. She has all the confidence in the world and she knows she can do it now. Congratulations to Valeria and her family – the sky’s the limit! Our daughter Raygen, before she started therapy was having severe headaches every day. She had a hard time making it through the school day. She never wanted to go to school and was doing poorly on all her tests at school. Today, I cannot remember the last time she has complained about a headache. Raygen also scored above grade level on all her tests at school. Her attitude is so positive now! If we had not done vision therapy our daughter would be in a much different place today. I truly believe she would have struggled her entire life if it was not for vision therapy. Jensley’s reading confidence has really improved as a result of vision therapy. She is much more willing to sit down with a book and attempt to read it now. She has learned strategies that help her focus on the words she’s reading. She loved coming each week and misses it now that she’s completed vision therapy! You all are great! Would you recommend vision therapy to others? – Definitely! We have seen a great improvement in Jacob’s school performance since the beginning of vision therapy. Not only has Jacob’s grades improved, but also his confidence in all activities. We have also seen improvement in his handwriting, but also reading comprehension. He has been able to excel in his courses through the help of Dr. Ford and we couldn’t be more pleased with the success of vision therapy. Since completing vision therapy, I have seen several positive changes in my child’s ability to see, to track across a page, and to stay on task without getting tired and frustrated. By far though his best improvement is his ability to complete a worksheet assignment. It has improved so much that he has gone from spending an hour on a worksheet to less than 5 minutes. It is so nice to see his gains. We are thankful for Dr. Kirkpatrick-Ford and her staff! They were so helpful during a difficult time! Kova was diagnosed with convergences excess. He had a tendency to look over his glasses and bring objects up close. He had problems with tracking and he would lose his place when reading or copying from the white board at school. Once we started therapy he was able to keep track when reading, words were no longer blurry. He is able to see the board at school and is able to transfer notes from the board to his paper. He enjoys reading books now. He can read much faster which has improved his confidence =). Once he started wearing contacts he no longer was tripping over things in plain view. With therapy he has improved in so many areas. Tracking, seeing clearer, depth perception, focusing, reading, writing and most of all his confidence in himself. He has changed so much over the course of therapy that his teacher and family can see a much happier, more confident boy. I’m so thankful for Dr. Ford and her staff. They made therapy fun and exciting. He enjoyed coming and doing all the different exercises. He misses coming into the office. We were amazed in the way her math and comprehension improved within weeks of starting therapy. The staff was amazing, and so willing to help, and very personable. We will ever be grateful in the assistance to help fix the issue which allowed her to grow her confidence and determination. Since Evelyn has gone through vision therapy, she has become a more interested and engaged reader. Her confidence in her academics has increased drastically. She loved working with everyone at South Tulsa Vision Development Center. Even on her last follow up appointment, she said she was going to miss seeing everyone. Jaylie moved from the top of her kindergarten class to near the bottom of her 1st grade class in reading and writing. To accommodate the academic decline, she was enrolled in tutoring first through third grade. As an auditory learner she could listen and comprehend instructions, but she began resisting reading and writing work during school, tutoring and home. The correlation between her vision therapy progress and her academic growth was and still is astounding. Now that she has completed her therapy program, we have also seen her reading (accelerated reading) scores and STAR Reading and Math scores have grown tremendously. Additionally, behavior in class has improved dramatically, she has been in much less trouble for talking and being off task during class time. Doing homework is a much more positive evening routine than before her therapy commenced and she now enjoys reading.